Travel Guru and Voyage Visionary, Poras Saklatwalla, is one of the founders of ‘Farohar Travels’, where his insatiable passion for Travel, impeccable experience in Hospitality and professional expertise in Finance and Planning, come together to deliver Perfectly Crafted Holidays for all. His specialty lies in providing each traveler the perfect holiday experience based on their customized travel preferences. Having visited numerous countries, Poras commands deep insight into the requirements of all travelers, especially Parsis. Poras Saklatwalla personally accompanies you on all his trips and takes charge to ensure that you are delivered the Best Holiday Experience Ever! Us Bawajis are nothing if not romantic! And love is nothing when not expressed!! This Valentine’s Day, express your love to those you cherish, in the most unforgettable way, with your favourite Travel Partner and Advisory – Farohar Travels. Known to have redefined the ‘HOLIDAY’ experience, thanks to their expertise in Crafting the Perfect Holiday coupled with their excellent Sense of Customer Service, Farohar Travels have gone a step further and cooked up an irresistible plan to redefine the ‘LOVE’ experience for you!! But before all else, I wish to thank the fabulous Parsi Community for your overwhelming response to our Advertisement in Parsi Times’ issue last week. Your interest and patronage, in the form of feedback and suggestions, is invaluable to us at Farohar Travels – and I request you all to continue the same… from my end, I will ensure to continue providing you your best Holiday experience ever! 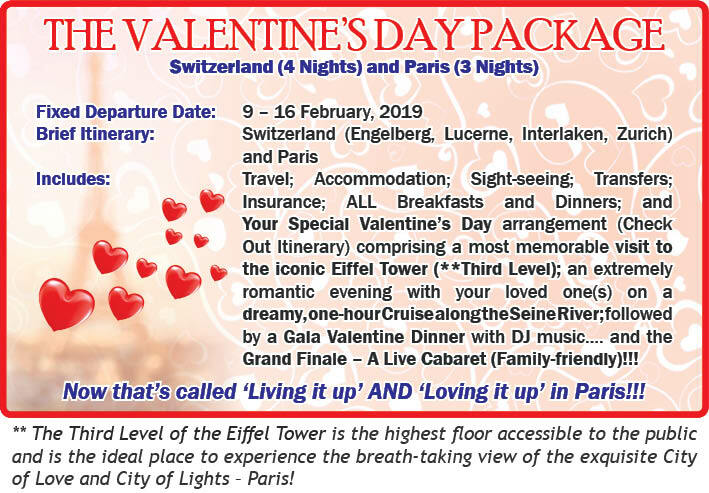 Keeping in with the demand of the ongoing ‘Lagan’ season, Farohar Travels is delighted to present its ‘Valentine’s Day Package’ – which takes you to the two most amazing places on earth: heavenly, serene Switzerland, and wildly romantic Paris! We plan on connecting one of the World’s Most Romantic People [us BAWAJIS] with the World’s Most Romantic Destination [PARIS] on the World’s Most Romantic Day [VALENTINE’S DAY]!!! How can anything top that??? Aimed at everyone who wishes to get a taste of this fabulous experience, and especially those who will be exchanging vows as man and wife in this ‘Lagan and Sagan Season’, Farohar Travels has yet again crafted the perfect Valentine’s Day Package! I know we can’t put a price on those three words, “I Love You”, but try saying that to your beloved atop the third level of the Eiffel Tower, nestled in the World’s Romantic Capital – PARIS – and you’ll know what I mean! As we already have a few honeymooning couples signed up, we would love to invite more of our newly married honeymooners or just couples-in-love to join us as it would provide the ideal company on the trip! And for all our foodies, my founder partner, Murad Shahuna, an incorrigible foodie bitten by the travel bug, will spice up the menus and provide the most authentic gastronomical tips to our bawajis who wish to explore foreign cuisines. And as always, we don’t subject our customers to strictly rushed-up time schedules – it’s your holiday – enjoy it at your pace! What’s more, unlike most Travel agencies which fluster their customers with undisclosed charges, Farohar Travels ensures 100% transparency right at the start.